On this 2nd Sunday of Lent the readings teach us about an extreme form of giving –sacrifice. This is perfected by Jesus whose interior sacrifice is paralleled by his sacrifice on the Cross. The Gospel testifies to the Lord’s interior life whilst Transfigured in prayer. Hence, it is by prayer that we enter the mystery of Jesus’ sacrifice rejoicing that the Cross leads to Resurrection! It is Lent and we are in training for the main event, Easter. At Easter the extent of God’s Love is revealed as God gives up his life for us. Our goal is to prepare our hearts, so they are strong, healthy and able to embrace this impossible Love God has for each of us! The readings are all about sacrifice, which is an extreme form of giving. Abraham must sacrifice his son and God must sacrifice his Son. When we come to the Gospel, Jesus is well aware that he will have to offer his life to bring about God’s kingdom, and end sin and death. The Transfiguration is an encounter between heaven and earth. It teaches us that God is never far from us. But before heaven and earth can come together forever, Jesus had to die first. Peter was told not to build tents because this mixing of heaven and earth was only temporary. Even so, Jesus wanted his closest friends to witness his The Transfiguration. This was to remove the scandal of the Cross from their hearts. Jesus wanted to reveal a truth to them: that he had to sacrifice his life and that his future death was a part of God’s plan. The Cross was not scandalous; it was not a punishment from God. Rather, God entrusted his Son with the mission to reveal God’s Love on the Cross. That involved sacrifice but God vindicated Jesus by raising him from the dead. To prepare Peter, James, and John for this ordeal, they were let in on God’s plan. This inside knowledge of Jesus’ Resurrection removed the coming scandal of the Cross from their hearts. Seeing his divinity, they knew that Jesus would rise from the dead which would give them the strength to keep believing in him when everything would seem to be lost. The Transfiguration also reveals the radical openness of mind and heart that we need to follow Jesus. Just as with Jesus who was at prayer, we learn to give and to sacrifice, through prayer. Lent is the perfect time to pray and prepare our hearts so they are open, generous and able to willingly sacrifice what God needs us to sacrifice, to bring about his plan. That kind of heart –a strong prayerful heart– is needed to embrace the impossible Easter Love God has for each of us. 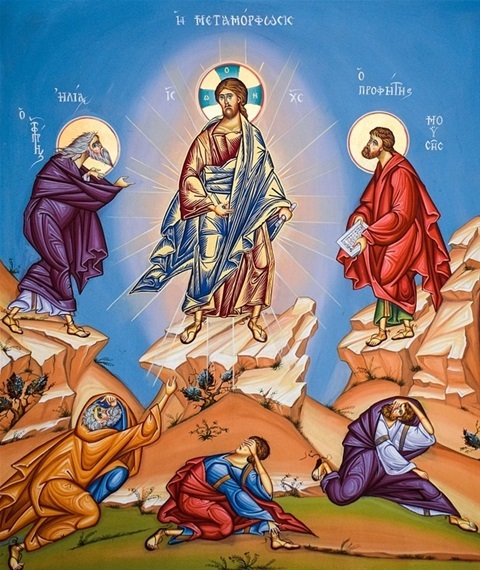 The coming together of heaven and earth –the Transfiguration– was only temporary. But with strong, prayerful hearts our journey of faith becomes a journey transfigured by the light of Christ. Heaven becomes a little closer for us journeying here on earth! Even when we must endure our crosses we press on knowing that all we do is undertaken in light of God’s promise to us –in light of the Resurrection– where heaven and earth will come together, forever! May Mother Mary intercede so we are faithful and keep up our end of this promise. Amen.